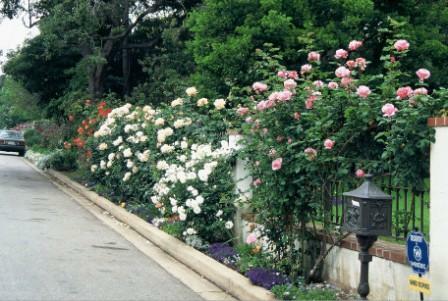 Train the canes of climbing roses as horizontal as possible to get a wall of flowers effect. I know this has happened to you. You buy a climbing rose, plant it, train the canes straight up the trellis and the rose only blooms way up at the top. Not the wall of roses you imagined! What did you do wrong? Nothing major. You just didn’t train the canes to encourage the rose to naturally put out more blooms. Climbing Roses bloom more when the canes are trained in a more horizontal position. This lateral canes to grow off the main cane. Those are the canes that bear the flowers. Laterals are the “side-shoots” that come off the main canes. they bear the flowers. To encourage more flowering train the main canes anywhere between horizontal and forty-five degrees. If you get to the edge of the trellis just keep winding the main canes back and forth across the face. We realize this may not make much sense to you so take a few moments to watch the video. That should clear it right up!